Dubai: Driverless cars, air taxis and unibikes. This is what the future of UAE's transport looks like. Matter Mohammad Al Tayer, Director General and Chairman of the Board of Executive Director of Roads and Transport Authority (RTA), spoke at the World Government Summit today (Monday), laying out the achievements of the RTA so far and what the country's plans are, especially for the Expo 2020. He spoke about the Government of Dubai's vision and how in other parts of the world private sector channelised change. However, in the UAE, the government drives change. "Yesterday, many speakers [at the World Government Summit] talked about how trillions of dollars are spent on research and development. However, with the UAE, the situation is different. Here, the government is the driving factor of change," he said. "In order to be a leader of change, you have to have a clear vision, foresight and capability to manage changes," he added. 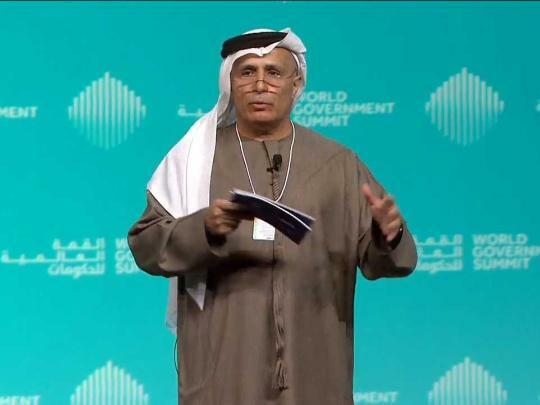 Al Tayer, however, specified that this did not meant that the private sector is not part of the innovation drives. He also spoke about how car ownership put a strain on infrastructure and the environment. "In Dubai, there are 3.5million people. We have more than one million cars coming in from Sharjah, which means that many people are accessing Dubai on a daily basis. The overall population can be estimated to be as high as five million. To service so many people you have to have infrastructure," he said. He mentioned RTA initiatives — like ekar and Udrive which offer residents the chance to use the car and leave it at their destination, this helps reduce the number of vehicles on the road. He added that plans were being considered to reduce the cars on the road further, with the aim of 25 per cent of commutes through the Metro. "We could start a Metro to link together all the cities. We need to determine the start and finish point." He added that His Highness Shaikh Mohammad Bin Rashid Al Maktoum, Vice-President and Prime Minister of the UAE and Ruler of Dubai, had laid out clear principles that defined the roadmap for the future. "In 2019, His Highness Shaikh Mohammad published three documents in the book Qissati and they discussed mobility and the future," he said. Artificial intelligence has helped the RTA analyse millions of data inputs every day because of its new information hub — the Enterprise, Command and Control Centre (EC3). Al Tayer spoke about how the more information one has about mobility, the more efficient one becomes through informed decision making. "In the past, in Dubai, on New Year's Eve, police would gather around Dubai Mall to manage traffic. Now, thanks to the EC3, we can see what is happening anywhere in Dubai," he said. Al Tayer also spoke about how artificial intelligence can be met with resistance from public transport users. "When we first launched the Metro, we had spent Dh30 billion on the project. However, the number of daily passengers was just 40,000 to 50,000. I went manic! "When I asked why the number were so low, I was told that people are afraid of the driverless trains. "So, I said: 'Just put drivers in and see!' Would you imagine, the numbers then went up to 120,000 daily. And today, without a driver, the (passenger) numbers are (around) 650,000 passengers a day," he said. He added that recently, when they ran a poll through their official Twitter account on whether people would use autonomous air taxis, 79 per cent said yes. "This result made me so happy ... accepting artificial intelligence takes courage."